BZ Sensors offers an RF circuit design team with extensive design experience in a variety of wireless technologies. Whether your product requires a standards-based wireless feature, such as ZigBee/Synapse, or a completely custom and optimized wireless protocol, BZ Sensors can implement the wireless technologies needed for your product. We can evolve our product concepts into a wireless design for production. We are experienced in working with clients and manufacturers to develop wireless products that can be economically built and tested in production. BZ Sensors RF engineers can design your wireless product, RF circuit or antenna. We utilize our in-house, state-of-the-art spectrum analyzers, signal generators, and network analyzers. Our engineers are experts in solving problems with unwanted RF emissions and susceptibility to achieve successful RF compliance testing. We are familiar with FCC and other compliance specifications. We have good working relationships with many qualified test labs. We also have relationships with all major cell carriers. BZ Sensors is a multi-discipline engineering design firm that provides full turnkey electronic product development to allow clients to get their new product ideas in the market quickly. We offer complete product development capabilities, starting with a product concept and finishing with a ready-to-manufacture design. We have a proven track record for on-time, on-budget high quality product realization. BZ Sensors provides specific design engineering services and expertise in electrical design, RF/wireless design, embedded software design, and mechanical design. We also provide engineering services and expertise in a variety of other technical areas including systems engineering, human factors, project management and product validation testing. Our engineers can complement a client’s in-house design engineering staff, working in partnership with clients on joint development projects. The BZ Sensors IoT LTE CAT1 Dev Kit is ideal for both the professional and hobbyist alike for creating IoT solutions. With the ever changing demands of wireless devices and the end of life for the 2G data network, the scramble for migration to the 4G data networks creates a new problem for problem solvers. The IoT LTE CAT1 Dev Kit provides an easy integration point for moving to the lesser expensive data rates over the CAT1 LTE networks. The footprint of the IoT LTE CAT1 Dev Kit allows for easy integration with the Arduino family microcontrollers (Uno/Mega/Leonardo). This form factor is designed to work like any of their other shield accessories for quick prototyping and easy proof of concept. The IoT LTE CAT1 Dev Kit can also be easily integrated to the Raspberry Pi plug-in adapter card. This option will allow the computing of more complex solutions than a traditional embedded system can offer. Contact BZ Sensors for activation and data rates. 4.00 (l) in. x 2.1 (w) in. x 0.76 (h) in. 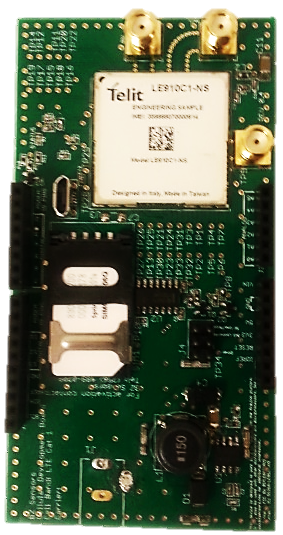 At the heart of the IoT LTE CAT1 Dev Kit is the LE910C1-NS by Telit. The Telit LE910C1-NS single-mode module operates in multiple bands, including: LTE B2, B4, B5, B12, B25 and B26. The IoT LTE CAT1 Dev Kit has integrated support libraries for MyDevices and DeviceWISE. These open source platforms allow for the easy rollout of IoT applications/solutions, minimizing development time and fast-tracking your solution to market. Connect to IoT in Minutes with the BZ/Sprint Design Platform! Designed with the goal of making IoT hardware prototyping as fast and inexpensive as possible, this dev kit reduces the length of prototyping cycles from a matter of months to just hours. By capitalizing on the combination of embedded IoT software and hardware that only a true end-to-end IoT enabler like BZ Sensors can provide. Couple that with the nation’s most reliable network, Sprint, and you have a platform you can rely on.